So every year, labor day weekend, I used to go to the On the Waterfront Festival in Rockford, IL. It was practically in my backyard, had great music, and plenty of action for the kiddies. On the Waterfront = Family Fun Time. I even wrote about it here a couple years back as an example of What’s To Like About Rockford. Last year, after 29 years, the city of Rockford cancelled On the Waterfront. Since I do try to make an effort to keep my blog upbeat and positive, I won’t discuss how politics, management, and lack of vision had a role in this historic festival’s demise. A festival that brought millions of dollars into our community. Or how Instead of scaling the festival back to something more reasonable for the economic times, those in charge kept it too huge to support itself. Nope, not gonna go there. Instead, I took my family, and my money, and went to DeKalb for Labor Day Weekend. The Corn Festival in DeKalb, IL, (a less than 30 minute drive from Rockford) is one of the last remaining free music festivals in Illinois and has been around since 1977. Musicians such as Lady Antebellum, Joan Jett, Survior, Night Ranger, Blue Oyster Cult, .38 Special, The Marshall Tucker Band,Jefferson Starship, The Smithereens, and Eddie Money have performed there over the years. The kids like the carnival rides, the kids activities, and the rummage sales. My daughter brought home an embellished jewelry box she found for $1.00 and was to-the-moon happy about her find. It’s also cool to see the historic Egyptian Theatre (picture above) which is said to be haunted and was investigated by paranormal researchers a few years back. And of course, there’s plenty of corn at the Corn Festival. As well as other carnival food I was not brave enough to try, but I took a picture of the signage, because, you know, seeing is believing. 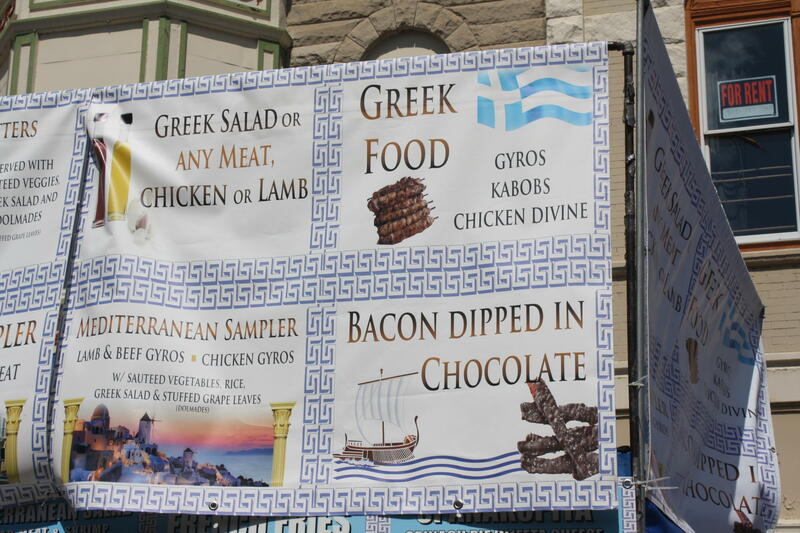 Who knew bacon dipped in chocolate was a Greek thing, right? Can you feel your arteries clog just thinking about it? 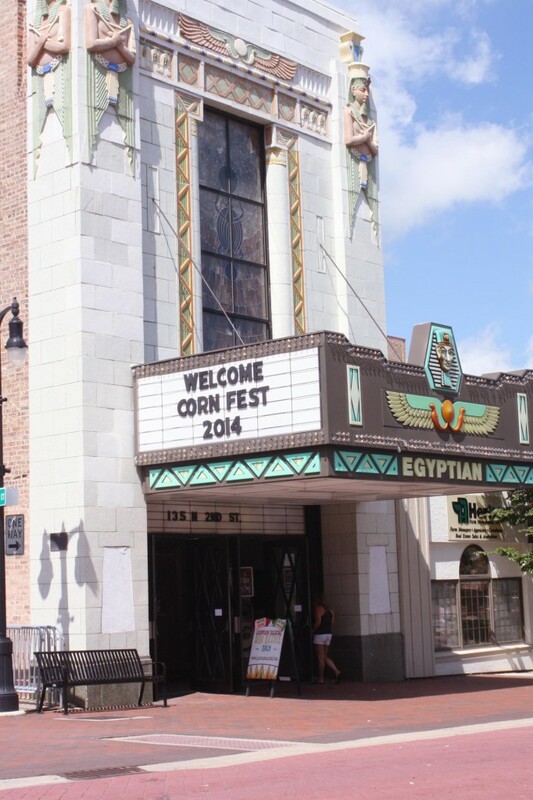 So until Rockford gets its act together, if you’re looking for something to do next labor day weekend, the DeKalb Corn Fest is a great place to spend a day or two.